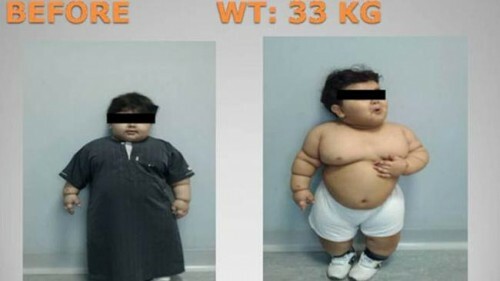 A two-year-old boy from Saudi Arabia is thought to be the youngest child ever to receive bariatric surgery to manage his weight. At 72 pounds, his legs had started to bow and he had developed sleep apnea that had started to disrupt his breathing. While unconventional, and unexplored territory, it seems that this may have been the only option for weight loss for the very young child. The surgeons that had carried out the surgery, Mohammed Al Mohaidlya, Ahmed Sulimana and Horia Malawib, had told the International Journal of Surgery Case Reports that two attempts had been made to control the toddler’s weight before even considering the surgery. These attempts, prescribed by an endocrinologist when the boy was just 14 months. At the time, he weighed 46 pounds. After four months of dieting, his weight had increased by an additional 17 pounds. Doctors from Prince Sultan Military Medical City at Riyadh weren’t able to determine whether or not the child’s parents had actually followed the diet, but when the young boy was finally referred to the obesity clinic, he’d weighed in at 54 pounds. Again, the doctors recommended dieting, but once he reached 72 pounds, surgeons decided to go ahead with bariatric surgery. Surgeons opted for a laparoscopic sleeve gastrectomy, which involved removing the outer margin of the stomach to restrict food intake. Only a sleeve of stomach, which is roughly the size of a banana, is left. Unlike the lap band surgery, the gastrectomy is not reversible. And it would seem that his case is a success, since he lost 15 percent of his body weight in just two months, and in two years, his BMI has dropped to 24, which is within the normal range for his age and size. But not everyone agrees that the surgeons did the right thing. This particular surgery is not recommended for children under the age of 14, and there are many concerns over how the surgery may impact his health in the future. However, despite his concerns over this particular case, he says that the surgery does have its place in adults and older teens. Petra Ecclestone Shops With Lavinia in LA!